Here at CRS Graphics, we offer a range of printed leaflets and flyers to customers in Nottingham and throughout the surrounding areas. We offer full colour leaflets which are available in a range of sizes and have a number of customisation options to choose from. As experienced flyer and leaflet printers, we have all the skills and tools needed to ensure a high quality and professional looking printed leaflets and flyers are produced. No matter what your requirements might be, you can always count on CRS Graphics. Whether you’re a local customer based in Nottingham or if your based somewhere else in the country, then you can still purchase our leaflets and flyers as we offer nationwide delivery. 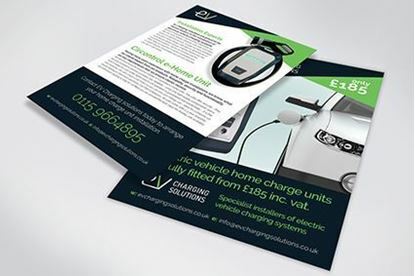 With our flyer and leaflet printing service you can count on CRS Graphics, to create beautiful and eye-catching leaflets for you. Whether it’s for an event, for use in your office or for mass marketing, then we have you covered. Having carried out leaflet and flyer printing for many years, we have developed a well-known reputation for the quality of the printed flyers and leaflets we produce. We have numerous different options to choose from such as A5 single sided leaflets, double sided A4 leaflets and much more. If you’re in need of printed flyers or leaflets in Nottingham, then be sure to choose CRS Graphics. We offer a full range of customisation options, when it comes to our flyers and leaflets; meaning you can create the perfect one for your needs. Orders can be placed easily through our online system or you can call us on 0115 940 0051 to place an order. One of our team are always on hands to provide guidance and assistance.